Prumnopitys andina (Poepp. ex Endl.) de Laub. Evergreen tree to 15m tall, crown broadly pyramidal or rounded; trunk smooth, 0.5-1m in diameter, bark grey. Branches verticillate or almost so, densely covered by leaves. Leaves 1-2.5 x 0.15-0.2cm, simple, alternate, almost sessile, linear, slightly falcate, usually dull bluish green, 2 whitish stomatal bands below, with a short mucron at the apex. Male-cones in spikes, each subtended by a linear-lanceolate bract. 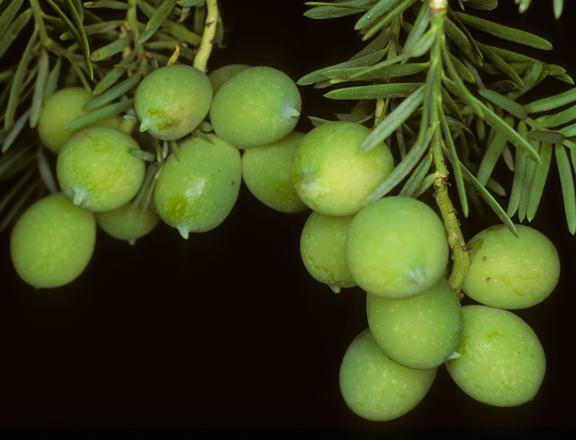 ; female-cones a plum-like fruit, 2-3cm long, yellow when ripe, sweet-tasting; flowers in november. Seed ovoid; fruits mature from january to march. 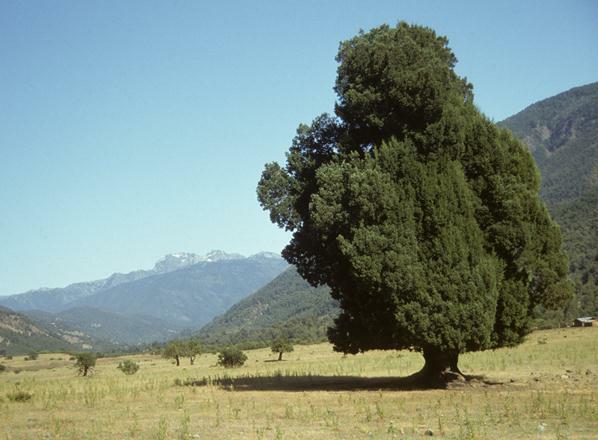 Endemic to Chile where its main distribution is in the Andes from Región VII (Province Linares, 35º 52’) to Región IX (Province Malleco, 39º 30’S). It also has a single location on the eastern slopes of the Coastal Cordillera in Región IX and one location in the Central Depression Región IX (Province Malleco, 38º 20’S) (Hechenleitner et al. 2005). mature individuals. 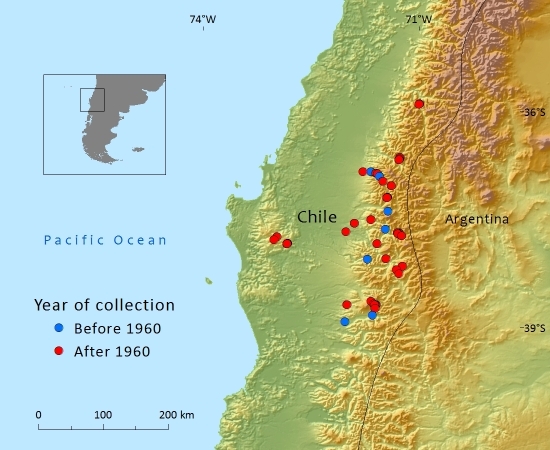 Notable locations include: Andes: (i) Región VII [Maule]; Valle de Maule. (ii) Región VIII [Biobío]; Fundo Los Ciervos. (iii) Alto Biobío. iv) San Fabián de Alico. (v) Termas de Chillán. (vi) Región IX [Araucanía]; Parque Nacional Conguillío; Coastal Cordillera: (vii) Región IX [Araucanía]; Los Alpes. Central Depression: (viii) Región IX [Araucanía]; 3 km from Pua. Prior to 1998, standard references for the flora of Chile considered P. andina to be endemic to Chile (Rodríguez 1983,11 Marticorena & Rodríguez, 1995).7Covas, (1998)2 cited P. andina as having an Argentinean distribution based on a herbarium specimen collected in 1936 by Cabrera (no. 3675) apparently from near the Río Aluminé in Prov. Neuquén. However, recently this specimen has been re–examined at the La Plata Herbarium, Argentina, only to find that the location label details relate to Ñuble, Recinto, which is located in Chile. Tortorelli (1956)13 lists P. andina as occurring in Cañadón Regolil (Prov. Neuquén), Argentina, which is very close to the Chilean border. 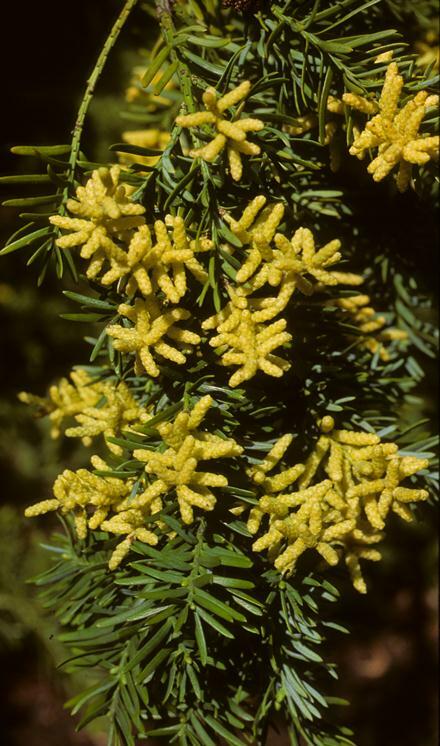 Local botanists and foresters have not been able to confirm the occurrence P. andina at this location, saying that the conifer Saxegothaea conspicua, which is not uncommon in the area, is often mistaken for P. andina. Although the wood is of value and was traditionally been used for house building, there is little evidence that the wood is widely used today. The actual area of occupancy is estimated to be about 36km². 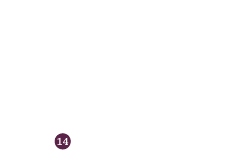 There are eight locations and eight subpopulations. Each subpopulation contains between 20 and 2,000 mature individuals (the majority have less than 200) and each subpopulation is at least 50km apart. Despite their physical separation, the majority are not considered to be severely fragmented under IUCN definitions. Several subpopulations show a continuing decline in quality of habitat as a result of over grazing, fires and the conversion of forests to exotic plantations. In many subpopulations regeneration is poor and there is also a decline in the number of mature individuals in some subpopulations. Although the total population of mature individuals is estimated to be less than 10,000 at least two subpopulations have more than 2,000 mature individuals and no attempt has been made to predict the extent of any future decline or to quantify the extent of past decline. Prumnopitys andina is threatened by a lack of regeneration in a number of subpopulations due to livestock eating the fleshy cones; this is further exacerbated by the delayed germination of this species at 'fruit-fall'. Grazing of seedlings and small plants is also a problem. In the Alto Biobío one subpopulation has been severely reduced by the damming of the Río Biobío for a hydroelectric scheme. Afforestation with exotic pines in the only location in the Coastal Cordillera has in the last 15 years reduced the subpopulation by 50% to an area of less than 500m² (Hechenleitner et al. 2005:6) this subpopulation is also suffering from livestock grazing. Volcanic activity and lava flows in Parque National Conguillo has fragmented the subpopulation: Volcan Llaima remains one of Chile's most active volcanoes. Prumnopitys andina occurs in only three protected areas (Parque Nacional Conguillío, P. N. Tolhuaca and Reserva Nacional Ňuble) which represents a small proportion of the total population. Recent molecular research (Martínez unpubl. data 2010) concluded that while there are low levels of differentiation between the subpopulations, significant levels of genetic diversity are found in the most northerly subpopulations in the Maule valley. This potentially important genetic refuge for this species suggests it has in the past experienced some degree of isolation. The International Conifer Conservation Programme (ICCP) has collected seed from most subpopulations and established an ex-situ network of sites in Britain and Ireland (including conservation hedges) comprising ca 600 genotypes. Covas, G. (1995). Flora Fanerogámica Argentina. Fascículo 4. pp. 23. CONICET. Gosling, P. G., Ives, L. M., Cunningham, V. J., Hechenleitner Vega, P., Brownless, P., Thomas, P. & Martínez, C. (2005). Preliminary Advice on Fruit Handling, Seed Pretreatment and 'Germination' of Embryos of Prumnopitys andina. Sibbaldia. 3: 41-50. Hechenleitner, P., Gardner, M. F, Thomas, P., Echeverría, C., Escobar, B., Brownless, P. & Martínez, C. (2005). Plantas amenazadas del Centro-Sur de Chile. Distribución, Conservación y Propagación. Universidad Austral de Chile y Real Jardín Botánico de Edimburgo, Santiago. Marticorena, C. and Rodríguez, R. (1995). Flora de Chile: Pteridophyta – Gymnospermae. Vol.1. Universidad de Concepción. Mill, R. R. & Quinn, C. J. (2001). Prumnopitys andina reinstated as the correct name for Lleuque, the Chilean conifer recently renamed P. spicata (Podocarpaceae). Taxon 50(4): 1143-1154. Molloy, B. P. J. & Muñoz-Schick, M. (1999). The correct name for the Chilean conifer Lleuque (Podocarpaceae). New Zealand Journal of Botany. 37(2): 189-193. Rodríguez, R. (1988). Lleuque. Prumnopitys andina (Poepp. ex Endl.) de Laub. Ficha Coleccionable. Chile Forest 148: 33-34. Serra, M.T., Gajardo, R. & Cabello, A. (1986). Prumnopitys andina (Poepp. ex Endl.) de Laub. Programa de protección y recuperación de la flora nativa de Chile. Ficha técnica de especies amenazadas. Corporacion Nacional Forestal, Santiago. Tortorelli. A. L. (1956). Madras Bosques Argentinos. ACME, Buenos Ayres. M. F. Gardner, 2013. Prumnopitys andina, from the website, Threatened Conifers of The World (http://threatenedconifers.rbge.org.uk/taxa/details/106).